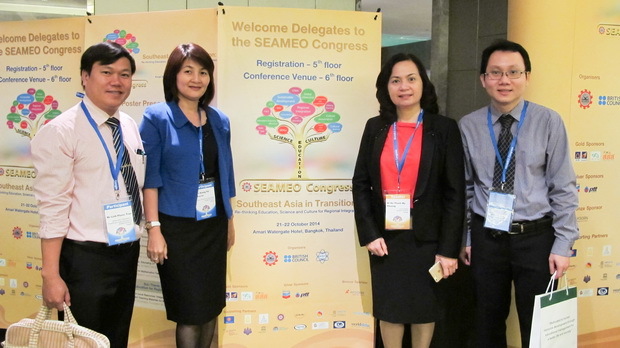 At the invitation of SEAMEO Secretariat, Dr. Ho Thanh My Phuong, SEAMEO RETRAC Director, headed the delegation from the Center to attend SEAMEO Congress with the theme on “Southeast Asia in Transition: Re-Thinking Education, Science and Culture for Regional Integration” from October 21 to 22, 2014 in Bangkok, Thailand. It was a big event co-organized by SEAMEO Secretariat, the British Council and the Institute for the Promotion of Teaching Science and Technology, Thailand. SEAMEO Congress was attended by more than 400 participants who are Ministers of Education, high officials, policy makers, staff of education ministries and related government organizations, educational researchers and practitioners from Southeast Asian region and beyond.